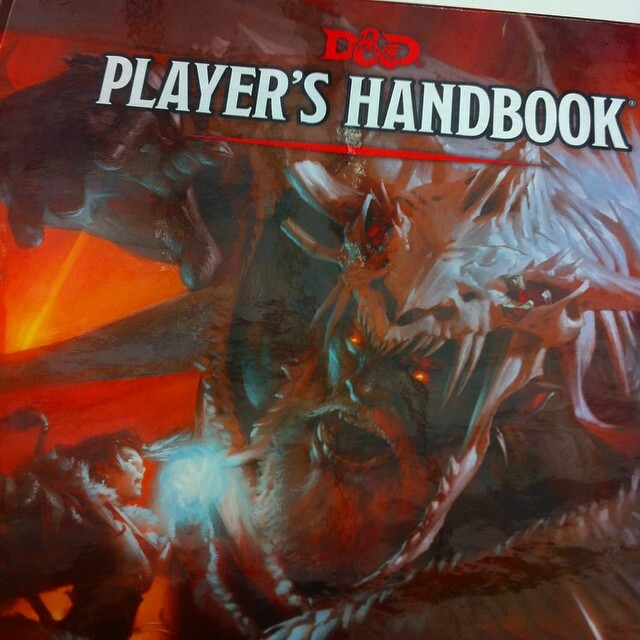 I recently bought and read through the new Dungeons And Dragons Players Handbook. It’s the first book published by Wizards Of The Coast in the classic roleplaying game’s fifth edition (sometimes called the “next” edition). Though I haven’t had a chance to play it, I wanted to write down some initial impressions. The first version of D&D I ever played was third edition. It seemed overburdened with its rules, almost wallowing in the details and exceptions. After that, I played in a second edition game. That version was charming in just how backwards it felt compared to the newer D20 system (a negative number is a good thing?). Most recently, I played in a fourth edition game. That was like participating in a board game or miniature strategy game. It was all about the management of powers than roleplaying. Even with just a read through of the first book, I can tell that fifth edition fills the sweet spot for me. Its light on rules, focused on intent, and leans toward the classic adventuring feel of earlier editions. The standard character creation trope is still here - you pick a race and a class - but the spirit of playing heros comes across more immediately. Each race and class has variations that lets your specific character feel special and lets you play it more like you want to play. Each new character doesn’t feel hampered in the low classes, having tricks and abilities that make you want to try it right away. The addition of Backgrounds to character creation brings elements of storytelling to a process that was previously regulated to homework assignments. The mechanics have been drastically simplified to gets the rules out of the way. All those various bonuses and minuses to all your different rolls have been replaced by the easy-to-remember advantage/disadvantage system. The power-creep of higher character levels have been reined in by a single proficency number. Fourth edition’s actions-vs-movement allowances are loosen up considerably with an expenditure of feet per turn. And there’s been a deliberate design decision not explain what every damn single word means in context of every damn single mechanic and roll. This is a straight forward system and assumes that we can resolve questions on rulings like grown adults. It isn’t all shiny and new, though. Some of the old editions still cling to it. This version returns to the theatre-of-the-mind type combat game, but the measurement of all movement and all spells carries along the idea of one-inch squares. A sidebar in the combat section of the rules admits as much, even if its considered “optional”, and hints that the upcoming Dungeon Master’s Guide will include fleshd-out rules for using fourth-edition-like grids. Also, not all of those niggling pluses and minuses to your rolls have disappeared. Things like cover can still give modifiers to your armor class, for instance. With so much of the game simplified, these numerical exceptions stick out as bookkeeping annoyances. This is a game that knows what it is and what it isn’t. This a game about being heroes, going on adventures, crawling through dark corridors, and slaying terrible monsters. Everything else is secondary, or in some cases, barely acknowledged at all. Combat is quick and flexible and open to description. Magic items are rare and toned down (currently at least; the Dungeon Masters Guide may flood the game with them). Skills are there to supplement your brave deeds, not to carry a game in and of themselves. If you like your game systems to have specialized mechanics for your social encounters, world building, or nuanced growth, this won’t be the right game for you. If I had to describe fifth edition based on my reading of the Players Handbook alone, I’d call it the updated second edition Advanced Dungeons And Dragons. Of all the previous versions, that’s the one it feels most like in execution, but updated to something sensibly modern. This is a game that I’d have a blast playing and feel confident in running. It has all the rules you need to play without mechanics and minutia getting in the way of your imagnation. If you're interested in more opinions, you can read some initial impressions by Charlie Hall at Polygon and Peter Bebergal at BoingBoing. And f you curious about trying Dungeons And Dragons fifth edition, I highly recommend the reading over the basic rules, made available as free downloadable PDFs.